Intensive care patients have, both before and after the ICU stay, a health-related quality of life (HRQOL) that differs from that of the normal population. Studies have described changes in HRQOL in the period from before the ICU stay and up to 12 months after. The aim of this study was to investigate possible longitudinal changes in HRQOL in adult patients (>18 years) from 6 months to 2 years after discharge from a general, mixed intensive care unit (ICU) in a university hospital. This is a prospective cohort study. Follow-up patients were found using the ICU database and the Peoples Registry. HRQOL was measured with the Short Form 36 (SF-36) questionnaire. Answers at 6 months and 2 years were compared for all patients, surgical and medical patients, and different admission cohorts. Differences are presented with 95% confidence intervals. The SF-36 data were scored according to designed equations. SPSS 11.0 was used to perform t-tests and Mann-Whitney tests. A total of 100 patients (26 medical and 74 surgical) answered the SF-36 after 6 months and again after 2 years. 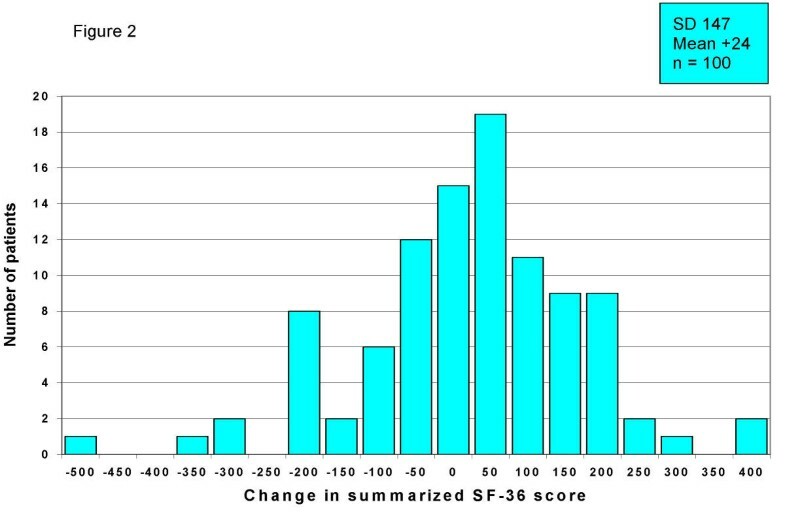 There was overall moderate improvement in 6 out of 8 dimensions of the SF-36, and the average increase in score was + 4.0 for all 8 dimensions. The changes for surgical and medical patients were similar. Neurological and respiratory patients reported increased average HRQOL scores, while cardiovascular patients did not. Patients with worsening of scores from 6 months to 2 years were insignificantly older than patients with improved scores (55.3 vs. 49.7 years), and both groups had comparable severity scores (simplified acute physiology score, SAPS II, 37.2 vs. 36.3) and length of ICU stay (2.7 vs. 3.2 days). The statistically significant changes in HRQOL (in the Role Physical and Social Functioning dimensions) were, due to sample size, barely clinically relevant. In a mixed ICU population we found moderate increases in HRQOL both for medical and surgical patients from 6 months to 2 years after ICU discharge, but the sample size is a limitation in this study. Intensive care patients have a higher mortality than the normal population up to 1–2 years after ICU discharge, but from that time further survival is comparable [1–3]. Health-related quality of life (HRQOL) is an important outcome measure after intensive care. A number of questionnaires have been introduced to investigate HRQOL [4, 5]. Results are found to be influenced by diagnosis, severity of illness, age and pre-morbid health status [6, 7]. Quality of life studies are often difficult to compare, since different intensive care populations have been studied and a variety of quality of life measures have been used, at different times after ICU discharge. In addition, the practice of intensive care varies . In general post-ICU HRQOL is found to be markedly reduced compared with population scores [9–14]. Several studies have found changes in HRQOL from before ICU and up to 6 or 12 months after, with worsening for patients suffering acute pathologies (i.e. predominantly surgical patients) and improvement or no change for patients with pre-existing ill health (i.e. predominantly medical patients) [6, 7, 15–18]. It has been suggested that follow-up after ICU discharge should last until further survival match population survival (after 2 years) and that simultaneous longitudinal changes in HRQOL can be a measure of effectiveness of rehabilitation and rate of recovery . Few such studies have been performed. The aim of this study was to use the Short Form 36 (SF-36)  questionnaire to investigate possible longitudinal changes in HRQOL from 6 months to 2 years after ICU discharge in a general, mixed ICU population. Our hypothesis was that average HRQOL would improve from 6 months to 2 years after discharge. Haukeland University Hospital is a 1000-bed tertiary referral hospital for 900 000 inhabitants in Western Norway. The 10-bed mixed ICU is predominantly surgical (70% of admissions). Heart surgery patients, neonates and burn patients are treated in specialized units outside the ICU. All ICU admissions are recorded in a database. Approximately 360 patients are admitted annually, with an average age of 49.5 years and an average ICU length of stay (LOS) of 5.0 days. Hospital mortality from 1997 to 2001 has been in the range of 28% to 32%. The main reason for ICU admission is chosen from 8 categories: neurological, respiratory, cardiovascular, gastrointestinal, postoperative, renal failure, trauma and miscellaneous. SAPS II is used for severity scoring. Adults (>18 years) with an ICU stay of more than 24 hours who were discharged between July 1999 and August 2000 were eligible to enter this prospective study. The Peoples Registry of Norway (Folkeregisteret) was used to identify survivors 6 months after ICU discharge. These were sent the SF-36 questionnaire with an information letter. The responders were sent the questionnaire again two years after ICU discharge. Non-responders received one reminder. The SF-36 is a generic, self-administered general health status survey with 36 questions aggregated into 8 domains/dimensions: General health (GH), Physical Functioning (PF), Role Physical (RP), Role Emotional (RE), Social Functioning (SF), Bodily Pain (BP), Vitality (VT) and Mental Health (MH). Each is scored from 0 (worst score) to 100 (best score). It has been tested and found both valid and reliable in the ICU setting , and is one of the recommended outcome measures . The SF-36 has also been found to be stable over time . SF-36 scores after 6 months were compared with scores after 2 years for a) all patients, b) medical patients, c) surgical patients and d) the 3 largest admission categories (neurological, respiratory and cardiovascular). We also compared the SF-36 scores after 6 months for the 26 patients who answered only once with the 100 patients who answered again after 2 years. There is no overall SF-36 score, but Mental Component Summary (MCS) and Physical Component Summary (PCS) have been used [13, 23]. In this study we chose to summarize the 8 dimension scores for each patient after 6 months and compare the sum with the individual sums after 2 years, thus dividing patients into one group with unchanged or reduced "total score" and another with increased "total score". These 2 groups were compared, as were medical and surgical patients, to see if there were differences with respect to age, severity of illness (SAPS II), length of ICU stay (LOS) and intermittent positive pressure ventilation (IPPV) times. All age data refer to age at ICU admission. The study was approved by the regional ethical committee. Continuous and discrete data (when appropriate) are given as mean values with standard deviations (SD) and median values with range. Differences between groups are presented with the corresponding 95% confidence intervals. The SF-36 data were collected in a FileMaker 5.0 database and automatically scored using previously published equations . SPSS 11.0 was used to perform t-tests and paired t-tests for SF-36 scores. The results were controlled with Wilcoxon signed rank sum test. The Mann-Whitney test was used for skewed continuous data. In the study period a total of 226 patients above 18 years and with an ICU stay of more than 24 hours were discharged alive from the ICU. Four were in the ICU for pure observational reasons, 31 died within 6 months after ICU discharge, 9 were lost to follow-up, 126 answered the SF-36 questionnaire and 56 did not answer. Two years after ICU discharge, another 14 patients of the 126 responders had died, one had moved abroad and 11 did not answer the SF-36 for the second time (Figure 1). The 11 patients who did not answer after 2 years had a mean age of 42.2 years, and the 14 patients who died between 6 months and 2 years had a mean age of 61.8 years. The 100 patients (100%) who responded for the second time were 60 males and 40 females, of whom 26 were medical and 74 surgical ICU patients. Follow-up status at 2 years for the 126 patients answering the SF-36 at 6 months after ICU discharge. There were no statistical significant differences in age, SAPS II severity scores, LOS and ventilator time (IPPV) between the medical and the surgical patients, or between patients with increased or decreased summarized dimension scores (Table 1). Age, severity, LOS, IPPV days Mean values for age and SAPS II and median values for *LOS and **IPPV days (hours/24). Comparison of medical and surgical ICU patients, and of ICU patients with increasing and patients with decreasing summarized SF-36 scores from 6 months to 2 years after ICU discharge. Differences between the groups are shown with corresponding 95% confidence intervals (CI) or p-values (the Mann-Whitney test). The distribution of individual changes in summarized SF-36 scores was close to the Normal distribution, with 92% of the changes being inside the interval from - 200 to + 250. The average increase in summarized score was 24 (Figure 2). Overall changes in summarized SF-36 scores Distribution of individual changes in summarized SF-36 scores (all 8 dimensions) from 6 months to 2 years, shown in intervals of 50 from -500 (maximum decrease recorded) to +400 (maximum increase recorded). Number of patients within each interval. 25% (25.6%) neurological, 24% (21.8%) respiratory, 18% (15.4%) cardiovascular, 12% (12.2%) gastrointestinal, 10% (10.9%) trauma, 6% (4.2%) postoperative, 2% (3.2%) renal failure and 3% (6.7%) miscellaneous. Table 2 shows the average SF-36 scores after 6 months and 2 years, with 95% confidence intervals for the differences, for all patients and the surgical and medical cohort. 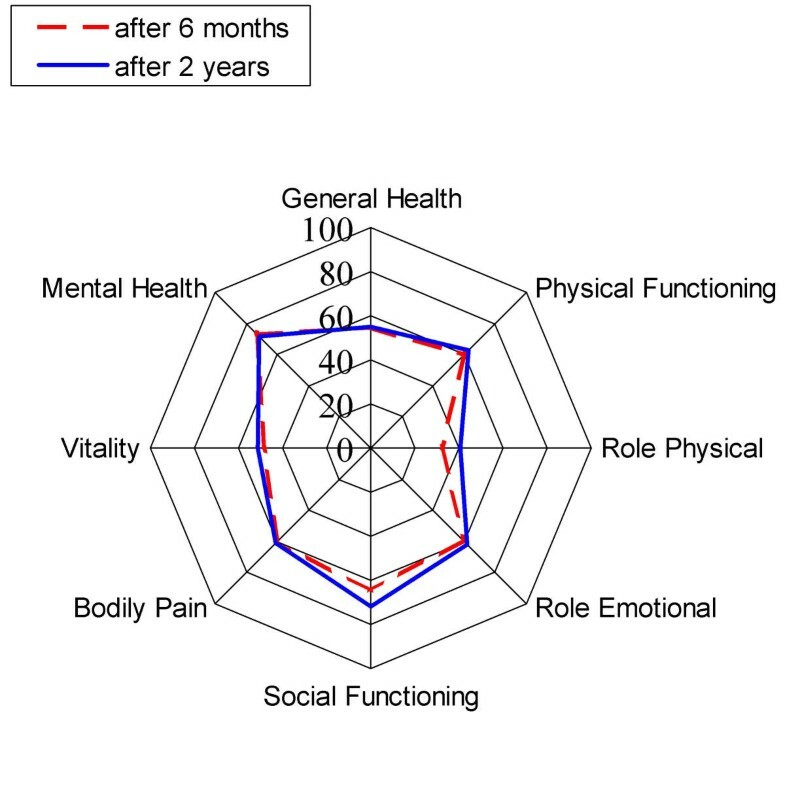 There was an increase in 6 out of 8 dimensions for the whole group, but significant only for Role Physical (borderline) and Social Functioning (see also Figure 3). Medical and surgical patients had the same pattern of changes. Moreover, the absolute dimension scores were also quite similar for medical and surgical patients, except for higher scores in the Physical Functioning and Role Physical dimensions for medical patients. Overall changes in the SF-36 dimensions Average SF-36 scores for all patients (n = 100) at 6 months (dashed line) and at 2 years (solid line) after ICU discharge. Changes in SF-36 scores Changes in SF-36 scores from 6 months to 2 years after ICU discharge (paired t-tests). Difference in scores at 6 months between patients lost to 2-year follow-up and patients answering after 2 years (t-tests). (GH general health, PF physical functioning, RP role physical, RE role emotional, SF social functioning, BP bodily pain, VT vitality, MH mental health. 0 = worst score, 100 = best score). The 26 patients that did not answer for the second time (after 2 years) had lower scores after 6 months in all 8 dimensions, significant for 3 dimensions and borderline significant for 2, when compared with the 100 included patients. The changes in SF-36 scores for the 3 largest diagnostic categories (representing 67% of all patients) showed improvement for respiratory and neurological patients, but not for cardiovascular patients (Table 3). There was a general increase in Social Functioning (significant only for respiratory patients) and Role Physical scores (significant only for neurological patients). All other changes were non-significant, but General Health and Physical Functioning scores decreased in cardiovascular patients and increased in respiratory and neurological patients. All 3 categories show increases in Vitality scores and reductions in Mental Health scores. Respiratory, neurological and cardiovascular patients Changes in SF-36 scores from 6 months to 2 years after ICU discharge for different ICU admission categories (paired t-tests). In this study we used the SF-36 questionnaire to measure changes in HRQOL from 6 months to 2 years after ICU discharge for 100 former ICU patients. We found general improvement in most dimensions, but significant improvement only for Social Functioning and Role Physical. The changes in HRQOL did not differ much between surgical and medical patients. There were differences between the ICU admission categories: neurological and respiratory patients experiences improved HRQOL, while cardiovascular patients did not. We found no significant differences concerning age, severity of illness, LOS and IPPV times between medical and surgical patients, or between patients with increased summarized SF-36 dimension scores and patients with reduced scores from 6 months to 2 years. Patients who did not answer after 2 years had significantly lower scores after 6 months than the rest. The diagnostic category distribution for study patients was similar to that of the total number of ICU patients. The interval from 6 months to 2 years after ICU discharge was chosen because there is little data on changes in HRQOL after discharge from the ICU, and we wanted to investigate changes up to the time where further survival parallels population survival. Studies of HRQOL have been performed at 3 months , 6 months [15, 10], 12 months [16, 6, 1] and longer after intensive care [3, 26]. Several studies have shown that HRQOL scores at 6 and 12 months after ICU are similar to pre-ICU scores for patients with pre-existing ill health, while patients suffering acute pathologies have lower scores than pre-ICU scores [6, 7, 15–18]. Functional outcome has been found to improve between 3 and 9 months in mixed cohorts , and between 3 and 12 months for surgical patients . A number of studies thus indicate that there are no major changes for medical patients, while surgical patients often experience marked initial reductions in HRQOL and improvement with time. Trauma patients do not reach their pre-ICU scores during the first or even the second year . Our data indicate that at 6 months after ICU discharge the HRQOL differ little between medical and surgical patients. One would expect a larger potential for improvement thereafter in surgical patients. It is therefore of interest that we find similar changes for medical and surgical patients in the interval from 6 months to 2 years, with moderate overall improvement (Table 2). Our findings contrast with a study reporting that mixed patients stabilize in HRQOL at 6 months after ICU discharge . Functional health status has been found to be reasonable 1 year after ICU for mixed patients , but dependent on diagnostic categories. Markedly reduced HRQOL scores have been found at 12 months (multiple organ dysfunction patients), 16 months (sepsis patients) and 18 months (trauma patients) after ICU [13, 14, 30]. In contrast, a study showed better functional outcome than baseline after 1 year in surgical patients (trauma patients or neurosurgical patients not included) . Since few studies have investigated HRQOL more than once after ICU discharge, we have little data to compare with. Our data indicate that cardiovascular patients have less favorable long-term changes in HRQOL than respiratory and neurological patients. We should be careful in drawing any conclusions here, since our groups are not very large, and within the "surgical" and "medical" cohorts there are clear differences in SF-36 scores between subgroups . The 26 patients who were lost to follow-up at 2 years had significantly lower SF-36 scores than the rest at 6 months (Table 2). The 14 patients who died between 6 months and 2 years were older (average 61.8 years), and the 12 others who did not answer for the second time were younger (average 43.3 years) than the 100 study patients (average 51.9 years). Our division of patients into groups with increased and decreased summarized SF-36 scores is arguable. Patients with very high or very low scores at 6 months can hardly be expected to experience higher or lower scores, respectively, at 2 years. We compared these groups, nevertheless, because the individual changes show a typical normal distribution and the great majority did not have extreme changes (Figure 2). The group with reduced scores from 6 months to 2 years had severity scores, LOS and IPPV time comparable to the group with improved scores, but clearly tended to be older (Table 1). This age difference was non-significant – probably due to small sample size. These findings may indicate that severity of illness and LOS influence changes in long-term HRQOL little, while age probably plays a more important role. In additon, elderly patients may report better perceived health than their functional status indicate [16, 25, 31]. Interestingly, we found no clear differences between medical and surgical patients either concerning SAPS II, LOS, age and IPPV time. The literature is definitely not conclusive about to which degree severity of illness, LOS, age, pre-morbid health status, diagnostic category and other parameters influence post-ICU HRQOL. This is no surprise since many studies are carried out in different ICU populations, with different tools and with variable points in time used for follow-up, making comparison difficult. Our study aims at giving some information about changes in HRQOL following the first 6 months of recovery. A weakness of this study is the sample size. Within one group a sample size of 100 is only sufficient to detect a clinically relevant 10 point change in SF-36 score over time, and a change of 5 points in Mental Health . This means that the sample size is a little too small to state that the statistically significant changes we found are clinically relevant. The tendencies are clear, though. The SF-36 scores were also compared using the Wilcoxon test, with the same results. Another weakness is that we know nothing about the HRQOL of those not answering. Judged by the demographic data, our study patients were fairly representative for our mixed ICU patients, but for HRQOL that may not be the case. As time passes by after ICU discharge, other factors not related to the ICU stay and concomitant conditions may of course influence HRQOL. We have not compared men and women separately in this study, in order to avoid too much complexity and small cohorts. A paper reported no gender differences in SF-36 scores 3 months after discharge from a mixed ICU . It is recommended that longitudinal studies should explore and account for correlation structures (within and between individuals) over time . This would mean use of more complicated statistical methods than we have used. We believe studies of longitudinal changes can give useful information about long-term outcome and rehabilitation after intensive care. This study indicates a modest improvement in HRQOL from 6 months to 2 years after ICU discharge both for medical and surgical patients. The sample size limits the interpretation concerning significance and clinical relevance. An important challenge for further research is to use this background knowledge to find out which interventions could improve HRQOL and increase the effectiveness of rehabilitation of former ICU patients. We would like to thank the Norwegian Research Council for financial support and Section for Medical Statistics, Dept. of Public Health and Primary Health Care, University of Bergen. RK carried out the data collection and analysis, and drafted the manuscript. HF participated in the design and coordination of the study, and has read, approved and contributed to the final manuscript.